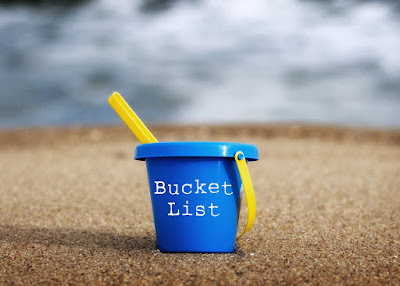 I've always wanted to write a bucket list-usually it is a list of things you want to do/accomplish before you die but since I find all that a tad bit morbid, in going to do mine of things I want to do by the time I am thirty. Now I can't go too crazy as I am incredibly aware that I only have three years to complete this lis, so I am limiting myself to five things. 1. Start a family- definitely something I want to have done by the time I am thirty. Having our own family is really important to both myself and Rob. 2. Do a charity run- I am in no way a runner- I cannot run to the end of my street without going red in the face and needing a lie down, but whenever I see a friend post a photo of her about to do the Race for Life, or someone asking for donations to sponsor them to run a marathon I get a pang of jealousy. I think the Race for Life will probably be the most likely one for me to go for. 3. Have some savings- savings is something I dream of having, but what with the prices of rent in the South and my severe lack of being able to save....we have had problems. 4. Go to America with Rob - we have both visited America with our families when we were younger but would absolutely love to go together. We were going to go for our honeymoon but the prices were ridiculous once you factored in food, theme park entry and travel. 5. Enrol on a beauty course- I have always wanted to do this as it is something I have always had an interest in. I nearly did it earlier this year but when I quit my job and took a pay cut it would have been silly to put more financial strain on the situation so I gave up my place at college. This would be a massive step for me and I would love to take it in the next few years. So there we have it, a mini bucket list that I have a mere three years to complete...eek! Better dig those trainers out now then....that one will be the biggest struggle!! As regards the running, a couple of months ago I was in the same position as you. Now I run 5k pretty comfortably, I even enjoy it a lot of the time! On Tuesday I managed 6k and in a couple of weeks I'm planning a longer run (11k) with my best friend - this will be my first ever trail run. I hardly recognise myself; it's amazing to finally be an actual runner! I wholeheartedly recommend getting yourself a running buddy and completing a couch to 5k programme - I'd tried learning to run a few times by myself but spend most of the time I was out thinking about how much I hated running and would never be able to do it. It's not half as bad when you've got someone with you to take your mind off it!!! That's great thank you! Let me know once you have written your list as I would love to see it! The running buddy sounds like a great idea I think I will definitely need one for motivation!